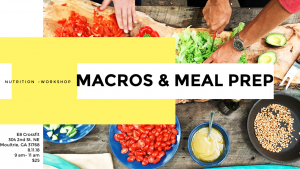 Don’t forget to sign up for the Nutrition Workshop: Macros and Meal Prep! August 11th, starting at 9 a.m., and only $25 per person! It doesn’t matter if you are just starting out or need to tune-up your macros, this class is for you! Call the gym at 229-891-0406 or stop by to sign up. You don’t have to wait until New Years Eve to make healthy changes for yourself. The time is now! Yes, I know there are hundreds/thousands of success stories from eating low carb, high fat diets. What frustrates me is the amount of effort it took to cook all that special food, is MORE effort than needed to just eat healthy. It’s like cooking and eating healthy is the last resort and seen as the most time consuming and expensive endeavor. I just don’t get it. Coming from an “athletic” point of view, there is no way I could have a low carb diet. I cannot fuel my body with fat to get me through a workout. I would crash and likely never finish a workout at the same pace and strength that I currently do. Take a look at RPStrength or WAG posts and you will see real people eating carbs, fats, and protein to lose weight, get in shape, or put on muscle. It burns me when people think they need to cut out carbs to get in shape or cut out any macro-nutrient for that fact. Moderation and tracking are two key ways to ensure a healthy diet. Avoiding a particular macro-nutrient is not realistic or sustainable. Life is full of obstacles. You are not on a straight track to success. You are going to be invited to group dinners, a birthday party, family dinners, Thanksgiving, you will forget to pack your lunch, you will get sick and not feel like cooking, etc. What is your plan? If you are going to pre-make all your own food and take it with you where ever you go, awesome! If not, you need to know what is in your food so you can make smart choices. Simply eating healthy is realistic and sustainable. What happens once you give-in to the temptation of carbs and get off the bandwagon? Or what happens once to you stop starving your body? More than likely, you’ll get it all back and then some. Tracking your food allows you to know what is in your food and helps you make healthy choices when you forget your pre-weighed meal. It allows you the freedom to go out to a restaurant and make smart, informed food choices. If you weigh and measure your food at home, you will eventually be able to make an educated guess at how much protein, carbs, and fat the waiter just placed in front of you. You will be able to inform friends, family, and coworkers the macro count on their plates as well. You will be a walking macro counting machine and feel pretty great about it! We scored some salmon for $7.00 a pound this weekend, despite having it recently, we couldn’t resist the deal. Salmon is hands-down my favorite fish to eat. We left the skin on, which does add to the fat, but you can opt to not eat the skin or buy a slab with the skin off. Before seasoning your fish, make sure you rinse it under running water and pat dry. Lay out a piece of tinfoil large enough to wrap the entire fish. Oil the tinfoil and both sides of the fish with extra virgin olive oil, place the fish on the tinfoil, then season your fish. We always season our salmon with Tony Chachere’s, very little salt (Tony Chachere’s is salty), fresh cracked pepper, lemon zest, and lemon slices. Enclose the fish in the oiled tinfoil and place on the grill. Check your fish often to ensure it does not dry out. I feel like July has gone by in a flash. The whole summer has gone in a flash. We have done so much traveling lately that I feel out of routine and have been missing a few staples to my usual menus, like beets. 🙂 This beet salad is sure to convert any naysayers. The sweet orange juice really makes this salad pop. Make sure to track the macros on this salad, because the orange juice will really jack-up those carbohydrate numbers if you aren’t careful. If you are new to beets, I recommend using golden beets first before diving into the more “earthy” red beets. Pork chops are a quick and easy meat to cook. I always throw mine in the oven at 425. The time varies depending on the thickness of the chops, so I always cook them to temperature. Sometimes I put a sauce on them or just season them based on the side dish. I am loving all these pretty summer salads. We are going to grill the corn when we cook the salmon. If you aren’t planning to grill salmon, throw the corn in the oven. I like to throw it in husk and all, it makes it easier to get the husk and annoying tiny pieces of silk off. I am buying lettuce and a salad mix for two other meals, so I will use a combination of those two for this salad. It calls for campari tomatoes, but I love heirloom tomatoes so I am going to add those instead. I am going to chop my tomatoes, grill the corn and cut the kernels off, and make the dressing ahead of time. It will be easy to throw the salad together once you have all the ingredients prepped and ready to go. The avocado is optional if you are trying to watch your fat intake. 1/4 of a large avocado is typical around 1 ounce and is 4.5 grams of fat. It is tempting to eat the entire avocado but you will be eating more fat than you realize. At the same token, make sure you don’t over eat on the corn. Yes, it is a vegetable but you need to be aware of the amount of carbs you are eating. Weigh out your salads too! You can overeat on healthy food and gain weight just the same! Josh recently went to the local grocery store and asked for them to cut-up a whole chicken to smoke on the grill. It costs about $5 for the whole chicken and they graciously did the messy work of cutting up the chicken for us. Now, this will obviously have more fat than just cooking a chicken breast. The skin adds a lot of fat to the chicken, but it makes for a juicer chicken. No one likes dry chicken. We aren’t getting a whole chicken again, we will just be eating the breasts. Legs and thighs are amazing, but we don’t need the extra fat. Josh wants to do a quick cut over the next couple of months, so I will be cutting back on the fat in my menus for him. You can grill the chicken ahead of time, cook it in the oven, or grill it the night of. Everyone needs some time to relax around the grill during the week. Make sure you have your vegetables chopped and ready to go for the grill or the oven. I love roasting random vegetables. It makes for an easy, healthy side. You can mix any vegetables that speak to you. I am going to grill or roast brussel sprouts, sweet potatoes, onion, butternut squash, and garlic. After I take out my vegetables, I like to top it off with some balsamic vinegar. This is an easy meal prep side dish that can last all week long, if you don’t want to make a bunch of different side dishes. These sandwiches are SO EASY! Avocado (optional), lettuce, matchstick carrots, steak, and a sauce. Super simple and so good. I use a single serving of non-fat greek yogurt cup to make the sauce. It calls for pickled jalapenos, but the spiciness depends on how many jalapenos you decide to put into the sauce. If you are lucky enough to still have venison cubed steak in your freezer, use it! I prefer to use cubed steak for these sandwiches, but unfortunately we ran out of deer meat a long time ago. I will tenderize our steak and season it before cooking it. I like to cook the steak in my cast-iron frying pan, it takes very little time, and I don’t use any oil in the pan. You can cook the steak and make the sauce ahead of time, to make supper easy-peasy. Another tasty summer salad before all the fresh, local veggies are gone! Growing up I loved tomato sandwiches, cucumber sandwiches, pineapple sandwiches…basically any fruit or vegetable with mayo and bread on both sides. My how things have changed…thankfully. I like to find tastier and healthier ways to incorporate vegetables beside on bread with mayo or eating them raw. This salad has the protein and carb superstar quinoa, cucumbers, fresh basil, and a homemade lemon vinaigrette. I love to make my own dressings and sauces. You know exactly what is in your dressing or sauce and it is fresh!